The donut crave is finally taking its peak today! 3 branches of this worldwide donut phenom will open its doors to every Cebuano in town. Grab that week's worth of savings and start falling in line in one of the 3 branches of Krispy Kreme in Cebu: SM City Cebu, Ayala Center Cebu and in I.T Park Cebu. 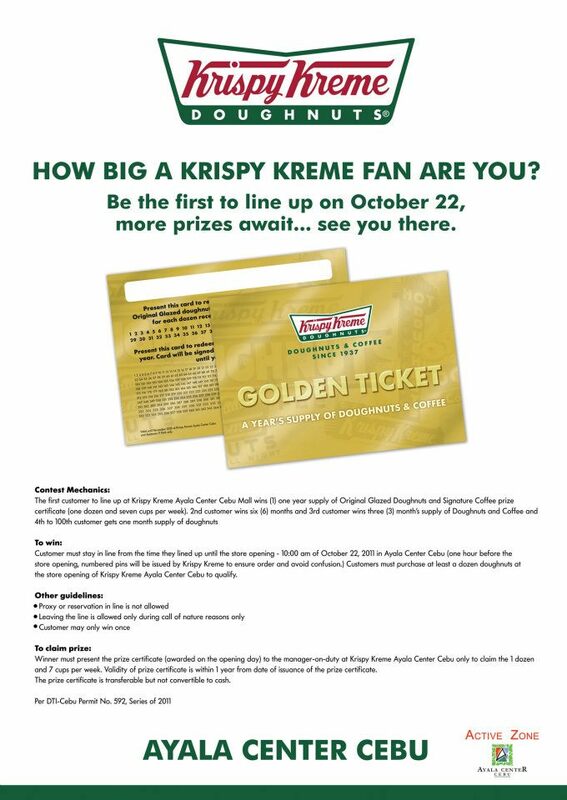 You not only queue for the prized glazed donuts but you might have the chance to win for yourself a whole year's supply of these babies! For the first 100 people on queue and purchased one dozen of donuts will get lovely prizes! 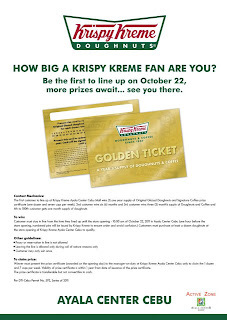 4th to100th person to purchase one dozen of Krispy Kreme Doughnuts – receives a complimentary dozen of Krispy Kreme Doughnuts on their next visit. Did you go line up yourself? I like donuts but the thought of a year's worth of donuts makes me want to puke! No, I was totally popped from work. I went home directly! You?